Alan and Michael Fleming are twins recently separated by residences in Brooklyn and Chicago. Attending the School of the Art Institute of Chicago as a joint entity, the pair have exhibited work in a range of venues including the MCA and the Sullivan Galleries at SAIC. Reflecting on their various attachments and detachments as brothers and artists, the exhibition “GAME ON” introduces the Fleming Brothers construct as an in-joke. 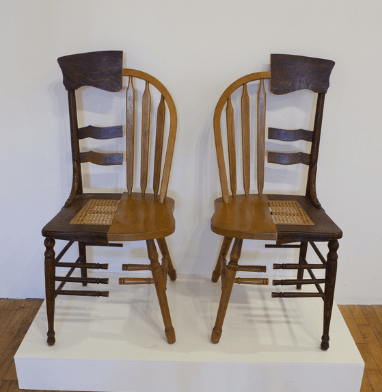 Distributed throughout the gallery is a year-long archive of postcards, videos, household furniture, drawings and sculptures produced by Alan and Michael since their separation in 2011. Confronting their binded intuition as twins, the Fleming Brothers aim to “map their distance” through body molds and algorithmic sketches reflecting a “disjointed studio practice” drawn from phone calls and psychic conversations—a physical representation of an innate mental and emotional oneness. 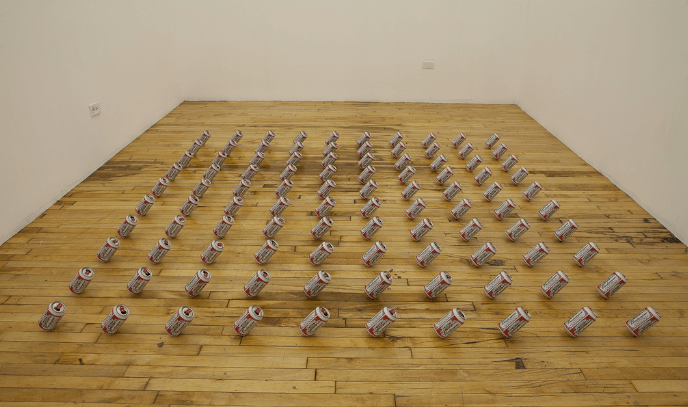 Their childlike brand of relational art melds into a love for easy, hipster fabrications of self-comfort in “100 Balanced Cans of Beer,” which is a floor display of Budweiser cans balanced on their edges. A video project titled “Who’s Bad” features a Michael Jackson dance lesson choreographed and taped in a New York City subway station. Thin on concept, the Fleming Brothers resist the challenge of moving beyond the guise of their own separation.